Republicans’ opinions of the Supreme Court have become less favorable during the Obama administration. As a result, more Democrats than Republicans now express a positive opinion of the Supreme Court – the first time this has occurred since the Clinton administration. Overall opinions of the Supreme Court are unchanged since February, at 58% favorable, but are somewhat less positive than in April 2009 (64% favorable). Over this period, favorable impressions of the court among Republicans have fallen by 18 points – from 70% to 52%. Democrats’ views of the Supreme Court have shown less change: 65% now have a favorable view of the Supreme Court, up slightly from February (57%), and about the same as in April 2009 (63%). Independents’ opinions also have changed little over this period. Currently, 58% of independents have a positive impression of the court. The latest national survey by the Pew Research Center for the People & the Press, conducted July 1-5 among 1,007 adults reached on cell phones and landlines, finds that the public’s perceptions of the Supreme Court’s ideology have changed little since earlier this year. 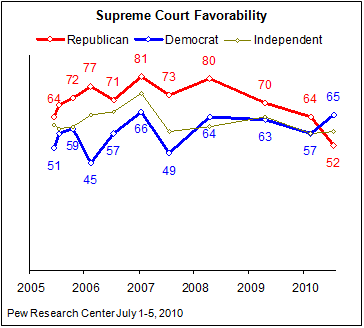 But compared with July 2007, fewer people view the court as conservative and more see it as liberal. Currently, 39% say the Supreme Court is middle of the road, while equal numbers rate it as conservative or liberal (23% each). In July 2007, 36% said the court was conservative, while 35% said it was middle of the road and just 14% said it was liberal. The belief that the Supreme Court is conservative has declined across the political spectrum since 2007. Yet among Republicans, in particular, there also has been a striking rise in the view that the court is liberal. The proportion of Republicans saying the court is liberal has nearly doubled over the past three years, from 18% to 34%. At the same time, the percentage saying the court is conservative has fallen from 26% to 12%. About four-in-ten Republicans (39%) see the Supreme Court’s ideology as middle of the road, about the same as in July 2007 (44%). Independents also are more likely to view the Supreme Court as liberal than in 2007 – 24% now say the court is liberal compared with 13% then. Still, a plurality of independents (41%) now sees the court as middle of the road. Democrats’ views of the Supreme Court’s ideology also have changed since 2007. 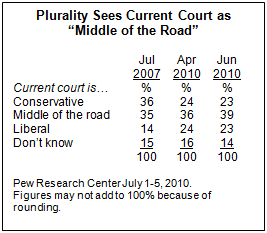 A plurality of Democrats (41%) now says the court is middle of the road while 31% say it is conservative. 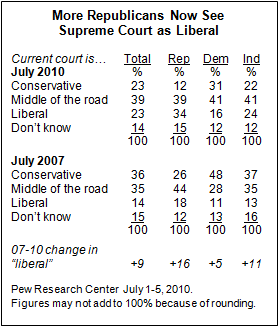 In 2007, nearly half of Democrats (48%) said the court was conservative while 28% said it was middle of the road. The new survey finds that the public’s views of Congress have improved a bit since reaching an all-time low in the spring. Currently, 33% say they have a favorable opinion of Congress while 56% have an unfavorable view. In early April, shortly after passage of major health care legislation, 25% expressed a favorable opinion of Congress and 65% felt unfavorably. In March, just prior to the bill’s passage, opinions were equally negative. Opinions of Congress remain far less positive than they were in April 2009. At that time, 50% had a favorable impression of Congress while 43% had an unfavorable view. Nearly half of Democrats (48%) now say they have a favorable view of Congress while 39% feel unfavorably. In both March and April, the balance of opinion among Democrats was more negative than positive. Favorable views of Congress among Republicans and independents also have risen since the spring. But the balance of opinion among both groups toward Congress remains decidedly negative. There also has been an improvement in opinions of the Democratic Party. Currently, about as many say they have a favorable opinion (44%) as an unfavorable opinion (45%) of the Democratic Party. In both March and April, unfavorable views of the party outnumbered favorable opinions – by 49% to 40% in March and 52% to 38% in April. 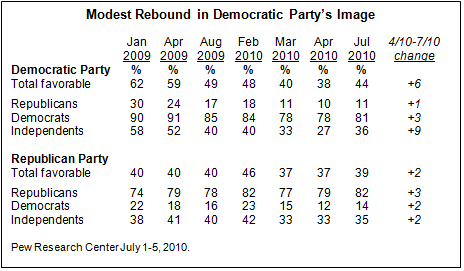 Still, the party’s image is far less positive than it was in early 2009. In January of last year, 62% said they had a favorable opinion of the Democratic Party. Opinions of the Republican Party have shown far less change over the past year and a half. Currently, 39% have a favorable impression of the GOP while 49% have an unfavorable opinion. That is little changed from views of the Republican Party in March and April. In February, opinion of the Republican Party was evenly divided (46% favorable/ 46% unfavorable) – their best showing since September 2008.